What sets the "Empire" actor apart is the way that his case has been managed. After Jussie Smollett emerged from the Cook County courthouse this week free of his state-level legal problems, prosecutors defended their decision to drop all charges against him by claiming that Smollett’s deal was nothing special. It’s true, according to legal experts, that thousands of people facing criminal charges see their cases dismissed every year. It happens regularly in Chicago and almost every major city. But what sets Smollett apart is the way that his case has been managed. 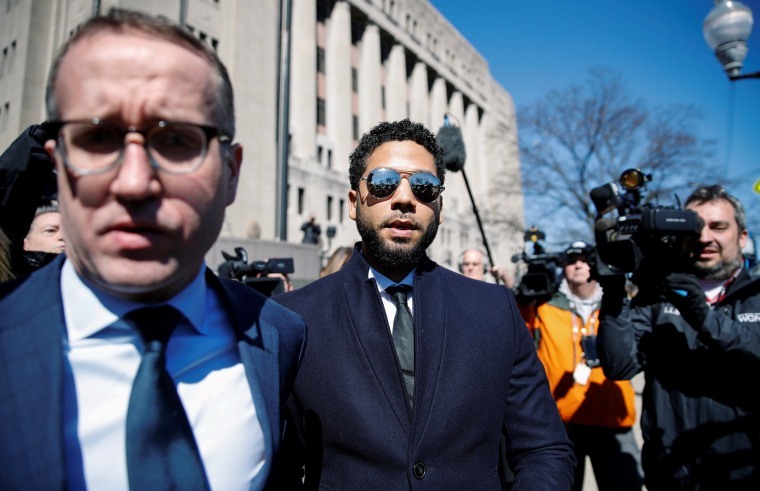 Smollett appears to have benefited from a process usually reserved for the politically connected and wealthy, descriptors that do not frequently apply to young black men. Smollett also declared himself exonerated — though he was not — and as a victim of both a hate crime and a system with a poor track record of treating people of color with fairness. All of that has happened while the city’s mayor, police and police union — all aware that thousands of charges are dismissed every year — view Smollett’s deal as highly unusual and unwarranted. They’ve described it as a singular stain on a city with a range of challenges in policing and criminal justice. “In all my time in Chicago, I have never seen anything that really is just like this,” said Tracy Siska, executive director of the Chicago Justice Project, a nonprofit that litigates for access to data describing what actually happens inside the criminal justice system. Siska has studied Chicago’s justice system for more than two decades. Chicago, like most major cities, maintains two prosecutor-controlled programs, one for felonies and another for misdemeanors, in which charges against defendants can be diverted. The county also operates drug courts and other programs where, if certain conditions are met, defendants diverted into them can see their charges dismissed. An analysis by NBC News of Cook County case data between 2014 and 2018 shows that between 55 percent and 69 percent of all resolved cases were ultimately dismissed by prosecutors. During that time, Cook County’s resolved case list shows that more than 135,000 people faced charges for crimes. Of these, more than 55,000 individuals faced more than one charge, like Smollett’s 16 counts of disorderly conduct. However, Smollett entered an even smaller group when he had all of his charges cleared. Between 2014 and 2018, just over 4,000 people had all charges against them deferred and ultimately dismissed. That’s a rate of a little over two cases per day. About 30 percent of those individuals were black, like Smollett, compared to the 24 percent share of Cook County’s population that is black. But, three different sources told NBC News that Smollett’s brief experience with the criminal justice system hardly qualifies as a diverted case. Diversion is a “red herring,” Siska said. Diversion programs began in the 1970s in cities around the country, in hopes of reducing the odds that law-breakers will repeat their behavior, said Michael Rempel, director of jail reform at the Center for Court Innovation, a nonprofit group that receives federal funding. Rempel is part of a team of researchers who examined diversion programs in 11 large communities, including Milwaukee, Philadelphia and Chicago, in a 2018 study commissioned by a division of the U.S. Department of Justice. Most of these programs continue to limit participation to nonviolent offenders. However, over time, the programs have pivoted to limit the number of people facing the lifelong collateral consequences of a conviction, and the cost savings that flow from dismissing nonviolent cases. This has allowed prosecutors around the country to concentrate resources on people suspected of committing violent crimes, the study found. It’s also an approach to the use of prosecutorial power that aligns with growing support for reducing mass incarceration. The programs require participants to undergo some form of short-term or long-term psychological evaluation or treatment, drug testing, court-approved community service or other check-ins. All of this typically requires at least a few court appearances and public statements about what happened. Some programs that divert felony charges last several months. Only after completing those conditions is a defendant’s case dismissed. As a matter of course, police officers involved in deferred and dismissed cases are also told when a dismissal is in the works and why. Documents tracking the defendant’s progress and explaining the decision are filed with the court. They are available for public review. That’s often true even when the case has been dismissed due to problems with the investigation or police misconduct. In Smollett’s case, the actor arrived at the courthouse with his lawyers for a hastily-called hearing. An agreement had already been established and the conditions satisfied. Smollett agreed to forfeit his $10,000 bond and had completed two days of community service at the Rainbow/PUSH Coalition, a civil rights organization founded by the Rev. Jesse Jackson, according to a letter from the group published in the Chicago Tribune. The organization subsequently disputed that characterization when contacted by NBCBLK. While Rainbow/PUSH declined to answer questions, the organization issued a statement describing Smollett as a “member” and his time with the organization not a function of a court order. The difference between the usual diversion process and what Smollett was required to do produced many questions about prosecutors’ decision. Foxx told reporters she recused herself from the entire matter after contact with a Smollett relative and an Obama administration lawyer, Tina Tchen, before Smollett became a suspect. That’s something that’s probably happened hundreds of times before, Siska said. But Foxx also sent an email to police expressing support for turning the case over to federal law enforcement, creating a public record. On Thursday, the National District Attorneys Association, the largest organization for prosecutors in the country, issued a statement that was clearly critical of Foxx’s decision. A recusal has to apply to the entire office, not just the elected prosecutor, the association said in the statement, adding that a statement of Smollett’s guilt or innocence should have been issued. Prosecutors should not take advice from politically connected friends of the accused, it said, and any kind of case resolution — especially in one as widely covered as Smollett’s — should, in exchange for diversion, end with enough information to know what actually happened. Also on the potential collateral damage list: anyone who is the victim of a hate crime, particularly black, gay men and anyone who experiences injustice in the criminal justice system, Siska said. They all may be less likely to report and less likely to believed when they do. Data journalist Joe Murphy contributed to this report.